ThermalTake shows off its new Tt eSPORTS Poseidon Z Forged, a mechanical gaming keyboard with a brushed aluminium finish. The peripheral comes with "Tt certified" blue or brown switches, blue LED lighting for the 104 keys, 10 macro keys, profile management, a USB hub, and audio ports. The MSRP is $139.99. Tt eSPORTS, the energetic and powerful challenger announces the launch of POSEIDON Z Forged mechanical gaming keyboard. The new POSEIDON Z Forged continues to provide gamers and fans a very cool customized gaming setup. This new keyboard is wrapped in an aluminum faceplate that gives a gorgeous sleek finish to the keyboard and with all the keyboards in the POSEIDON Z series, Tt eSPORTS continues to offer the world’s first 5 year warranty for mechanical keyboards. 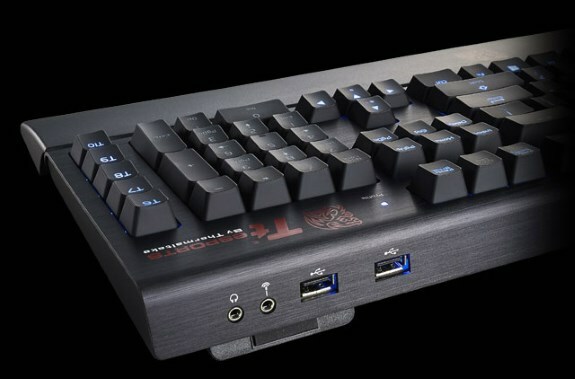 The POSEIDON Z Forged comes with both Tt certified blue & brown switches with full 104 key layout with blue lighting, features 10 additional macro keys for gaming efficiency, along with 5 profiles for a total 50 programmable macro on its normal mode plus another 5 extra profiles for game mode, this gives a spectacular total of 100 programmable macros for both normal and game mode. POSEIDON Z Forged also consist I.S.S. (Instant Shift System), allowing users to use either the Shift, Ctrl, or Alt key to quickly switch between macro groups and give immediate access to all 100 macro keys). Tt Certified switches testing process for these mechanical switches was an arduous one, but these switches passed, result in a lifespan of up to 50 million key strokes. Furthermore, the all-new POSEIDON Z Forged is also designed to be used seamlessly with a built-in dual USB port hub and USB sound-card (DAC Audio Microcontroller Unit) with headphone and microphone jack. The POSEIDON Z Forged also features 5 different adjustable brightness levels and with an additional pause-break lighting effect. In addition, 5 different pre-configured lighting zone combinations have also been designed for gamers’ usefulness. Detachable USB cable also has been designed for easy storage and travel.